In previous articles, I have mentioned that there are a few ways to mitigate the high costs of communicating when travelling. In this article, I’ll go over your local prepaid service choices when traveling to the US. Prior to suggesting any prepaid phone plans, I strongly suggest that anyone traveling to the US set up a Google Voice account. A Google Voice account will give you a US phone number that you can forward to any US number. It will also give you an avenue to route all your calls to Canada at no charge. Among the cost benefits, your Google Voice number can be your contact number for continuity. Assuming your trips to the US are infrequent, you may be changing your US cell phone number each time you go (I have lost many SIM cards in my life). Also, your contacts might try to call you back when you are physically no longer in the US. Using a Google Voice number will allow you to forward these calls wherever you like, be it to your email, your new US cell phone number or your Canadian cell phone (see my article). Here is my article on setting up Google Voice from Canada. 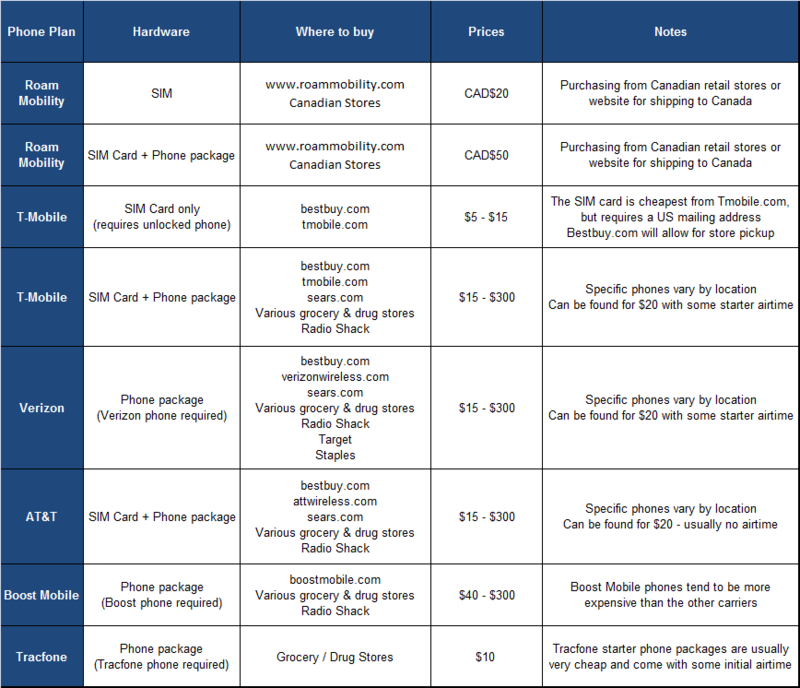 In my analysis, I compare plans that are offered by US carriers. These are plans that are designed for customers who live in the US. As a result, they don’t mail required hardware to Canadian addresses, however, you can pick up hardware at most retail outlets in the US. You can also use eBay or other online sources to buy the required hardware and have it shipped to you. (I used to bring US phones and SIMs to Canada to sell them to traveling Canadians). Roam Mobility is a Canadian service geared towards traveling Canadians. It works the same way that US prepaid phone service works, but they are more sensitive to Canadian needs, including shipping to Canada. Their daily prices are higher than the US carriers, but they don’t have a minimum refill amount so in some instances they can be cheaper than US carriers. From my analysis, I think that the best solution for anyone traveling to the US would be T-Mobile prepaid. They have different plans that may serve different markets but some of their features make their products particularly attractive to travelers. For most travelers, I suggest the T-Mobile daily plans which will cost you $2/day or $3/day and differ only in the speed of internet. This is the solution that I use when I travel to the US, be it for a day trip for some cross-border shopping or for a week long trip to Boston. If you are planning on using your own unlocked phone with T-Mobile’s service, you should be aware that the protocol for data uses AWS / 1700 technology. In Canada, Wind Mobile and Mobilicity use this protocol, while Rogers, Bell and Telus do not. In my experience an unlocked old Rogers Blackberry phone was unable to use T-Mobile’s data service, but was able to use the voice and text. My Samsung Galaxy S2 phone compatible with Mobilicity and Wind in Canada does work with all of T-Mobile’s services. Phones that work with T-Mobile, Mobilicity and Wind should also work with Rogers, Bell & Telus. If you are investing in a new smartphone, you may want to buy one that is compatible with T-Mobile etc, even if you are using Rogers, Bell or Telus etc. service in Canada. This will give you a lot of flexibility, and may save you money. I have compiled my favorite 7 offerings. These plans are offered by the big 4 carriers (Verizon, T-Mobile, ATT and Sprint) and should be available nationwide. I find the smaller carriers (Tracfone, Net10 …) don’t really have the best offerings for travelers. One thing to bear in mind is that for short trips, your minimum refill might dictate how much you have to spend. If you are going for only 3 days, and the minimum refill is $10, you might as well go with a $3/day plan. Roam Mobility can be a good service for you if you are going for a short period of time due to T-Mobile’s $10 minimum refill and hardware limitation. If you are going for more than 2 days, Roam Mobility’s daily charges end up being more than $10 so there is no cost benefit over T-Mobile. Roam Mobility is great if you don’t have the ability or desire to order a T-Mobile SIM form eBay or buy one in a retail store when you get to the US or you don’t have hardware that is compatible with T-Mobile. I actually really like the T-Mobile $100 / year plan for people who are frequent travelers to the USA. This allows you to pay upfront and then not really think about it for a year. The refill lasts a year, so you don’t need to worry about using it up each trip. You can benefit from saving up your minutes to when you actually need them. This is probably the best plan for people who use their phone as a voice phone as heavy data usage can end up being costly on this plan. The Verizon phone plan works best if everyone in your group gets a Verizon phone. You can call each other (along with other Verizon phones) for free. Something to note with is the $15 minimum refill. If you are going for 5 days or less, you are still better off with the T-Mobile plan ($2/day) that will allow you to refill only $10 at a time. With the T-Mobile plan, there are no daily charges, but there are use charges. Since the daily $2 plan is so cheap, it only takes 6 minutes of voice or 20 texts (or some combination) in a given day to make it a better choice than the $0.33/ min plan. Also, remember that if you are buying this for a 1-time trip, the $10 refill may expire before you can use it up. There may be no sense in reducing your cell phone usage to save funds that are likely to expire. With the Tracfone, I have found that the prepaid packages are usually easily found for $10 and under at the low end. These usually come with 20 minutes of starter time or the like. These work great as a throwaway phone if you just want to buy a cheap package and keep it with you for when you MAY need it. There are many places to buy the hardware you require. In some cases, you will need to have the hardware, be it a SIM card or a physical phone shipped to you. Roam Mobility ships to Canadian addresses while most of the US carriers do not ship to Canadian addresses. I have had experience with T-Mobile actually not wanting to ship a SIM card from their online store to my US mailing address even though the billing address and shipping addresses match and are in the US. You should be aware that due to various US regulations (they want to spy on you), online phone service sales appear to have many reporting requirements and try to get a lot of information from you before they send you your hardware. You may be better off buying in the secondary market (ie eBay). Currently I spend 175 days in the US as a winter Texan. I bought a Tracfone so that I could cover emergencies while travelling. But once I return to Canada the phone shuts down at the border. I chose the $100/365 day card to retain my phone number and have instant access to a phone when returning to the US. I would like to have a phone that works in both countries. Am I correct in assuming from your article that my best options would be T-Mobile @ $100 or Roam Mobility? Also I don’t own a cell phone other than said Tracfone. If you live in Canada 1/2 the year and in the US 1/2 the year, I really think it makes sense (financially) to have separate plans. I think that the convenience of having a single phone plan is expensive in that you will always be paying one entity for the major privilege of being able to use the other’s network. That being said, there are plans that have this ability. I see Wind Mobile (Canada) heavily advertising a $39 (+tax) plan that includes using T-Mobile’s network unlimited voice and data, so that would be a great fit for you if you live in a Canadian city with Wind Mobile coverage (Southern Ontario, Calgary, Edmonton, Vancouver). Mobilicity also has a plan that gives you 50 minutes / month of roaming, but I have struggled to get data to work in the US using Mobilicity service. If you need to use a major carrier (Bell, Rogers, Telus) in Canada, then paying for US usage is going to be pricey. There are add-ons, depending on usage, so run the numbers. An easy fix that will always work is to do what I suggest with the T-Mobile $100 / 365 days plan or $2 / day or $3 / day plan or even the $30 / month plan that I discussed in the follow up. Personally, I have a single unlocked phone. I use Mobilicity in when I am in Canada (Toronto city). When I go to the US, I usually use an existing SIM card from T-Mobile and forward my Google Voie number to that account, so I don’t care what that number is. I have thought about buying up new sim cards that have great promotions for the first week / month etc and just getting the use of that for the week that I am in the US at a real bargain price. About incoming calls — people in US call a texas, california , (whichever state) you/I am situated but friends in Canada can call me on the Canadian cel # , right? and would that be considered local or LD? If people call your Canadian cell then it would be local for them. IF you are in California (for example) then either your Canadian cell phone will ring if you havent forwarded that number anywhere. If you pick it up, then you get charged roaming. (you might even be charged roaming if you dont pick it up). If your friends call your US number (TMobile number mentioned above), then your friends pay the long distance toll and you pay nothing. BTW, we have a new article coming out on TMObile in the next few days. It will be very valuable for you. I need some advice. We are travelling with kids from Ontario to Minnesota and back in 7 days. We have 2 Galaxy Tab III tablets and want to access youtube etc (data essentially) for kids’ entertainment while on the road. I am estimating the usages to be around 5 gigs for 7 days. Currently those tables use my home WiFi to connect to internet and it is not under any plan. So whenever we are out, those are not connected to internet. But this is a long trip and to keep peace , I am inclined to get some data plan for 7 days. I was just wondering if you have any advice for me? Wow. That is going to be a LOT of data, so you are likley to pay a pretty penny for that if you had to pay that in roaming. I would suggest that you get a sim card for TMobile or Simple Mobile or H2O wireless. See if you can find someone selling a free first month sim card. In the past I have been able to get a TMobile sim card that gives the first month included, and it was unlimited with 5Gb of tethering. We were able to get this for about $15 on eBay. See if you can find something like that, though they are harder to come by. If you go regularly to the US then I suggest getting a RingPlus plan. You pay a little bit upfront but hten there are essentially no fees going forward and you get an alottment of minutes to use every month. It only works in the US. You may also want to investigate republic wireless or Google Fi. Both are cheap-ish prepaid options though require investment for the hardware. I live in Canada but will be travelling to the states a few days a week for the next 2 years for school, and would like to be able to use my phone regularly. Any recommendations on the best option financially for this? I am living in Orillia area and travelling to California. Can I buy a phone and SIM card in Buffalo and use it in California, or do I have to go to California first and buy one there? We’re only going for 7 days so need your suggestions. There are lots of options. I would say get a local sim card when you get there. If you are going for 7 days, then the best thing is to pick up a SIM card on eBay for a plan in the US. As mentioned on some of these articles, get something from T-Mobile as that tends to be good fvalue for the first month. Otherwise H2O seems to be a good one. If you serach on eBay you will find a lot there. Don't subscribe All Replies to my comments Notify me of followup comments via e-mail. 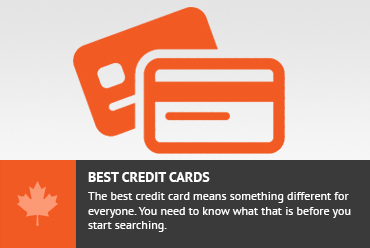 You can also <a href='https://www.creditwalk.ca/comment-subscriptions/?srp=1004&srk=2648578ecea05c83754707575dc5a494&sra=s&srsrc=f'>subscribe</a> without commenting.